Ok, maybe Madness is a little too dramatic, but it let’s your customers and attendees find you on a busy tradeshow floor. 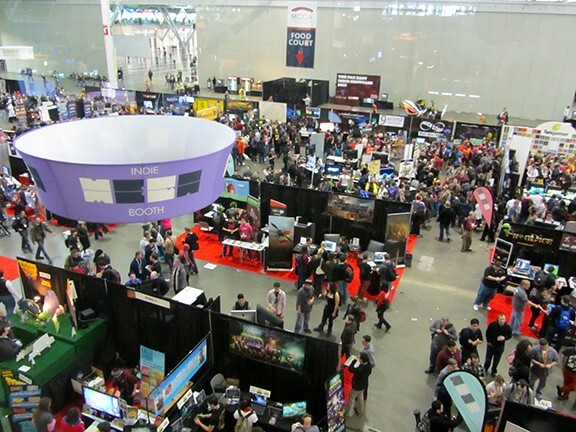 In a lot of ways it is important to maximize your space since let’s face it, reserving your booth costs a lot of money. Having a large overhead presence to attract attention and draw people over to your space will help you maximize it’s full potential. More traffic means more leads. Here’s another way of looking at it. You may (or may not in which case ignore this part) spend a lot of money and time to be found in other areas of your marketing plans like SEO, Paid Advertising, etc. Your booth is no different and the goal is to break the chains of anonymity and shine bright like a diamond (my 1 and only Rihanna reference, I promise). Most likely, that big Hanging Sign is the first thing your customers will see. Whether you have a recognizable Brand Name or you are working on building your Brand Name, your Hanging Sign is the perfect space to showcase your logo and company colors. If your customer’s know your company colors are Orange and White, they may be looking up and skimming the show floor for those colors. Sounds strange, but it’s totally true since we can find colors much faster than we can read text. Have an Orange and White logo? Great, I recommend putting it up as large as possible so those eyeballs have something to locate at your next show. Those small details will set you apart from competitors (who are also probably at the show). What Size and Shape Hanging Sign is Best for my Booth? This question is often asked and while much of the selection process is completely subjective, there are a few pointers to keep in mind. will work for your other Booth Sizes. If you have a 30X40’ Booth Space at your upcoming show but have a 20X20’ space at your next show, you may want to select a size that will work for both. rotating sign, you might be better off with a circle. Make sure to know how large of a sign you are allowed given your booth space. For many small booth sizes like 10X10’ or 10X20’ you may not even be permitted to have a Hanging Sign. For other larger booths like 20X20’ you may have a 1ft set back around the perimeter, meaning the largest size for that size space would be 18’ wide X 18’ wide. It really depends from show to show, so make sure to check your Exhibitor Manual. Since these signs need to be portable AND large, they are made from materials that combine strength while still being lightweight. Most Hanging Signs (ours included) are made with an aluminum tubing “push-pin” frame system. This frame is designed to be assembled and taken apart many times without any tools aside from maybe an allen wrench (aka hex tool). The diameter of the tubing depends on the size and weight of each sign. The larger the sign, the larger the diameter for the added support. To give you and idea though, a 10ft Hanging Sign usually has about 1 1/ 2” Diameter Frame. Am I going to get to the show and sit there for hours trying to put it together? No. Each frame has labels (little stickers) on each end of each piece. One might say “B5”. You just find the other piece that has an end showing “B5” and Wah Lah! They snap together. It is that simple. All the guess work is taken out of it for you. In addition to this great label process, each will come with a guide showing the diagram and general instructions. The Fabric Graphic is printed using a Full Color Dye Sublimation Process. If this sounds oddly complicated, don’t worry! It is just a fancy term for using a printing/ dye method so the ink goes all the way into the polyknit fibers of the fabric so it isn’t just a sprayed top layer. That helps give it the full bright colors you’d come to expect for making an investment like this. With most Hanging Sign Shapes (not including flat signs or signs with bottom graphics) you have the outside that is printed and the inside can either be a blank white or black fabric material or you can choose to make it double-sided and have printing on the inside. This is great especially for Exhibitors that want the inside printed with their company pantone color. What! What? You can match our Company PMS spot color? Yes! This service is $75 and includes Next Day Air Shipping. We just need the PMS Spot Color or Process Color and we will print and send you what we like to call… A “Hard Proof”. This is where we simply print a small square piece of fabric and mail it to you so you can assure accuracy before we start on the large sign. Pretty slick, I know! At the show, you ( or most likely the show labor) will first assemble the frame together and the graphic simply goes over the frame like a pillowcase. It will have the outside fabric and inside fabric that are stitched together at the bottom, but have a zipper on the top. Once you’ve pulled the outside and inside of the fabric up and over the frame, you simply zipper the two pieced together along the top. This pulls the graphic nice and snug and gives that ‘stretch fabric’ look everyone is after. Fire-Resistant Sometimes the trade show contractor will want proof that the fabric is fire-resistant. Rest assured, our material meets the standards set for it to be fire-retardant. You can download a copy to keep on file here. Better to have this on file and not need it since if you can’t prove it meets the standards at the show, they will spray it with a chemical that is fire retardant and add it to your bill (it’s usually not much, but still…). There are two types of lighting used for Hanging Signs. Clamp Lighting and Lightbox Lighting. Some Exhibitors will have LED Lights that shine on their signs. 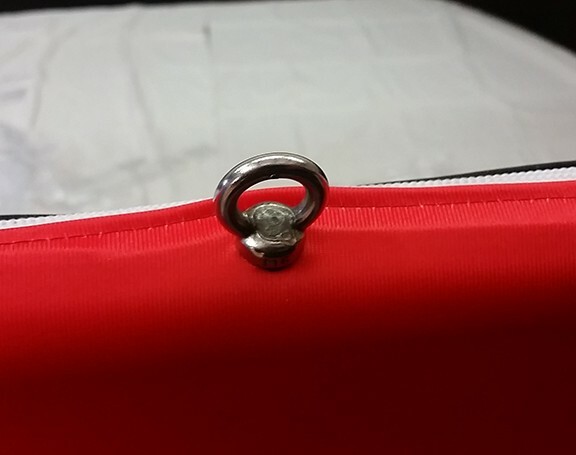 They just clamp onto the frame (usually over the fabric) and face backwards to light up the outside or inside face. Just keep in mind that these do require electricity and that they can add a little weight from the lights and cord so it can be tricky to balance the sign so it is straight (especially when rotating). I recommend asking the show if this is something they can set up and do. Not all Convention Centers have this capability. Since I mentioned this above, I’ll just briefly touch on this topic again. You can print not only the outside of the sign, but also the inside. This gives it an extra touch of customization and can take advantage of the real estate on the inside of the sign that is still visible by attendees as they look up. Since Hanging Signs usually are shipped separately from the rest of your Trade Show Display materials, it doesn’t hurt to give it that added protection of a Hard Case. When we ship from our location, they come by default in a Soft Travel Bag that is inside a Cardboard Box. This usually holds up just fine for a least the first few shows. If you plan on shipping it a lot, you will want something a little sturdier, that you can slap a label on and send it off. Some Exhibitors make room for it inside their crate and then retrieve the Hanging Sign once they are at their show. Just make sure you know where the sign is supposed to ship well beforehand. Once we know this, we can either send you (or your graphic designer) the Full Size Artwork Templates or you can send us your artwork ( in vector format) and we will add it to the template at no extra charge. Different Shapes and Sizes have different Lead Times. If you order a Standard Shape and Size (let’s say 10ft diameter X 36” tall Circle) then the production time is about 5–6 Business Days. If on the other hang you order a Non-Standard Shape (like the 10ft Tapered Circle) you can expect this to take 10–12 Business Days. Even more for Custom Shapes and Sizes. Typically we like to have 3 weeks for Custom Sizes and Shapes once the order is placed. Need help determining if your artwork will work? No problem, fill out the form below and you can send it to us and we will look to see if it is in vector format or High Resolution to prevent pixilation. If it is too low resolution, don’t worry! We may be able to Vectorize the artwork for you. Like everything else Trade Show and Event related, there is a fair amount of planning involved before the doors open and your current and future customers swarm the halls. But not to worry, there are just a couple steps to take. If you are planning on shipping directly from us to the show, we will need the Hanging Sign Shipping Label. This is the label generally provided by the General Show Contractor (like Freeman or GES). Sometimes they can be found on the show’s website and sometimes they are in theExhibitor Manual PDF (example) that is emailed to you when you reserve your booth space. Either way, this label is important because in addition to the UPS shipping label, the show’s Hanging Sign label needs to be affixed to the outside of the package before it ships out so that it goes to the proper address and then gets routed to the proper location where all hanging signs are stored until the big move-in day. Here is a link to an Example Hanging Sign Shipping label. It asks for your “Booth Number” and the “Company Name” that you used to reserve your Booth Space. We will ask you for this information when you place your order so that everything goes smooth. They want to know how heavy the sign is and how involved the sign is to put together so that they can make sure to have the proper equipment available the day your hanging sign goes up. For super heavy signs, they use truss or chain lifts. They also calculate the weight that will be placed on the convention ceiling so it doesn’t exceed total weight bearing limits. Knowing beforehand the location and position of the sign over your booth space helps the show contractor plan and understand logistically how to make that happen. They also want to know how high off the floor it should be. This is where I really recommend that you have a representative present when the sign goes up at the booth to make suggestions and can help oversee the process. Lastly, this section will often have the cost and rates for hanging your sign. Check to make sure this figure is included in your marketing budget for the show. For Companies that have a large Custom Hanging Sign, the show may require an “Engineer Stamp”. This is essentially having a professional engineer certify that it meets or exceeds the requirements to be structurally sound. It provides a layer of safety for the show, exhibitor and attendees. The standard shapes and sizes you see here on our website do not require this. We have done custom signs up to 50ft wide that have not required an Engineer Stamp, so it really depends on the show. They have certain criteria that will ultimately determine if it is necessary. Great, you’ve made it this far! Chances are you are well-armed with the information you need for a smooth and successful show! Keep in mind that Hanging Signs are usually one of the first Move-In items on the Convention Floor. The reason is simple: There are tractor lifts that need to navigate the floor to rig the cables that will be used to suspend your sign. It is MUCH easier to do this before the displays are set up. While the Show Site labor (aka: Condor Crew) will most likely assemble the Sign, it is recommended to have a company representative available to answer questions while it is being set up and rigged. It’s not 100% necessary, but highly advised. It’s also not a bad idea to keep track of time. When the crew starts and stops. This will help prevent any clerical mistakes when the bill finally arrives. Chances are that the crew responsible for Hanging your Sign will be using their own cables to suspend your sign… and for good reason. They have cables that meet or exceed certain structural weight ratings. It is important to keep all the signs that are hung from the convention ceiling consistent. Since the show has no idea of the rating of each individual exhibitor’s cables, it makes sense to go with the show’s cables. Sometimes it is an added charge, but from what I have seen/ heard, it is pretty nominal. If you have a show coming up and would like more information about finding the perfect Trade Show Hanging Sign, please fill out a contact us form and we would love to help!